This café has nothing in common with the famous Kaffeehäuser of the Ringstrasse, which dazzles you with grandeur. But this small café has everything that a connoisseur of Viennese coffee tradition needs: a beautiful old room with a traditional interior, neither radio nor music, many newspapers for free which you are welcome to read for hours and last but not least all the different coffees, cakes and sweet and warm dishes which have been known to us since the emperor’s days. It must have been ages since the last renovation, if there ever was one. But this fact makes the place very charming and special. 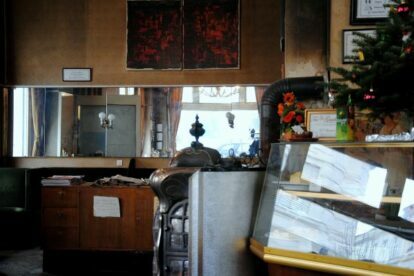 You see the old tapestry, lots of black & white pictures of regular guests (like more or less famous actors), green velvet sofas and chairs – and an old peculiar furnace which heats the whole café in winter times. This is not a very touristy place, so be gentle, be smooth and enjoy.